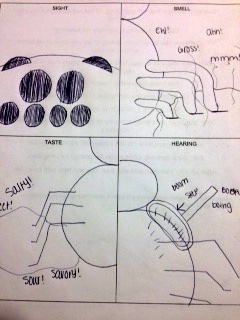 Eighth grade Lesson Mystery Creatures Discovered... AAAHHH, It's a Spider! 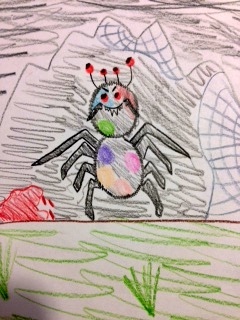 LESSON 1: Mystery Creatures Discovered... AAAHHH, It's a Spider! LESSON 8: Biodiversity: What's the Big Deal? SWBAT recognize several characteristics and the habitat of spiders. 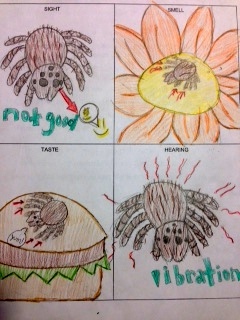 Students begin to investigate the "alien" nature of spiders to begin to appreciate their beauty and importance. Complex and microscopic structures and systems can be visualized, modeled, and used to describe how their function depends on the shapes, composition, and relationships among its parts; therefore, complex natural and designed structures/systems can be analyzed to determine how they function. Some background: This lesson is adapted from a Smithsonian unit entitled Under the Spell of Spiders. I love using spiders as the focus creature for biodiversity. Not only is there a staggering variety of spider species, some of which are quite adorable, but they are easy for students to find and study within their own home environment. I just leave the containers on my file cabinet and allow the students to look at them as they wish. Before long, the majority of students have investigated the spiders at least once. To begin the lesson, I have students review list of characteristics of the amazing life forms found on mystery planet X using the Creatures From Planet X Chart. After analyzing this chart (SP 4), students use the list to draw an illustration of what they think these creatures look like and the habitat they infer as appropriate to the listed characteristics. (Some habitat information is present, but there is room for more thinking.) 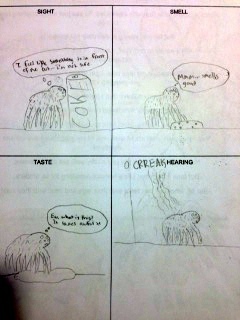 Encourage students to think about what they would call such a life form if they were the first to discover it. I recommend having students draw their picture on computer paper using colored pencils rather than in their science journal. In my experience, students take assignments more seriously when they think they will be turned in separately. I have students tape their final product into their journal. Student drawings should vary based on interpretation of the data provided, however all illustrations should have strong connections back to the chart. 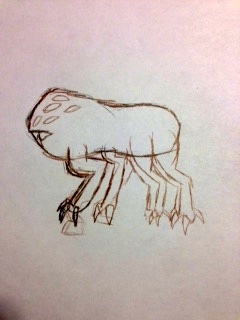 After students have all drawn their version of the mystery creature, I reveal to students that Planet X is Earth. I ask students to look closely at their trait chart and see if they have any guesses about what the mystery creature is. Someone will usually recognize it as a spider at this point since they have been unofficially observing them in my class for some time now. Show students The Incredible Diversity of Spiders PowerPoint to introduce them to large variety of spider species in the world. I take students through the presentation and have them tell me what they noticed about the different species in general, asking them to name the similarities and differences they noticed. I suggest putting the PowerPoint on a relatively fast loop and having students create a T-chart of features all the spiders seem to share on the left and features that seem unique to individual spiders on the right. I am not looking for anything specific as the whole point of this lesson is about generating interest. Following the PowerPoint I show students this short video that answers some common questions about spiders. I ask student to create a T-chart in their notebooks with one side titled "Things I Wonder" for students to record any questions they think of during the video and the other side titled "Wow, I Didn't Know That!" for facts they find amazing. It might be beneficial to pause the video after each answered question to allow students time to write. I find that most students don't want to miss anything and will not write if the video is not paused. Plus, students seem to think it is required they respond when time is provided. To end the lesson I have students read Tallulah Tarantula Tells All, a free verse poem which highlights a bit about how spiders sense the world. I ask students to create one illustration for each of the senses that are described in the Tallulah poem (sight, smell, taste, and hearing). 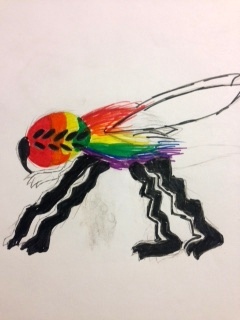 This is completely open to student interpretation, and does not necessarily have to relate to spiders, as I really just want the students to think about and make a connection with the information provided in this creative format. This type of drawing activity forces the student to strongly consider the text in order to determine what to draw. The drawing of the picture requires the student to continually process that information while they are working. Both of these help students remember this information better and for a longer period of time. Also, in my opinion, the emotional connection that students have to their drawing (both good and bad - we all know how funny those bad drawings can be!) helps students remember this experience for a long period of time. 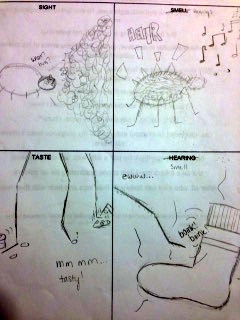 The following student examples show the type of variety of ideas students have with this assignment. This video explains how I introduce this assignment to students and the work samples are in the resource section.